Phred Kent Peterson of Issaquah, WA, wrote A Cyclist’s Christmas story in 1999 dedicated to Jean Parker Shepherd. If the phrase, “You’ll put your eye out,” means anything to you, then you’ll understand this story. For you non-bikers out there, a fixie or fixed gear road bike is a bicycle that doesn’t have gears and doesn’t allow you to coast. The chain is connected directly to the rear wheel, so the pedals are turning all of the time the rear wheel is turning. Go down a hill really fast, and your legs are a blur trying to keep up with the pedals. Conventional bikes have what’s called a freewheel that will allow you to coast without pedaling. Most modern bikes have gears that will let you ride up hills easier. Fixed gear bikes have only one gear: one that’s too high to climb with and too low do descend with (from this rider’s perspective). Have a Merry and a Happy from palmbeachbiketours. P.S. 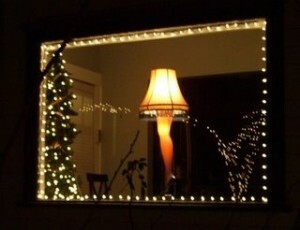 If “you’ll put your eye out” and leg lamp don’t ring a bell, see A Christmas Story for a refresher.